(Also, "Bellarmino"). A distinguished Jesuit theologian, writer, and cardinal, born at Montepulciano, 4 October, 1542; died 17 September, 1621. His father was Vincenzo Bellarmino, his mother Cinthia Cervini, sister of Cardinal Marcello Cervini, afterwards Pope Marcellus II. He was brought up at the newly founded Jesuit college in his native town, and entered the Society of Jesus on 20 September, 1560, being admitted to his first vows on the following day. The next three years he spent in studying philosophy at the Roman College, after which he taught the humanities first at Florence, then at Mondovì. In 1567 he began his theology at Padua, but in 1569 was sent to finish it at Louvain, where he could obtain a fuller acquaintance with the prevailing heresies. Having been ordained there, he quickly obtained a reputation both as a professor and a preacher, in the latter capacity drawing to his pulpit both Catholics and Protestants, even from distant parts. In 1576 he was recalled to Italy, and entrusted with the chair of Controversies recently founded at the Roman College. He proved himself equal to the arduous task, and the lectures thus delivered grew into the work "De Controversiis" which, amidst so much else of excellence, forms the chief title to his greatness. This monumental work was the earliest attempt to systematize the various controversies of the time, and made an immense impression throughout Europe, the blow it dealt to Protestantism being so acutely felt in Germany and England that special chairs were founded in order to provide replies to it. Nor has it even yet been superseded as the classical book on its subject-matter, though, as was to be expected, the progress of criticism has impaired the value of some of its historical arguments. 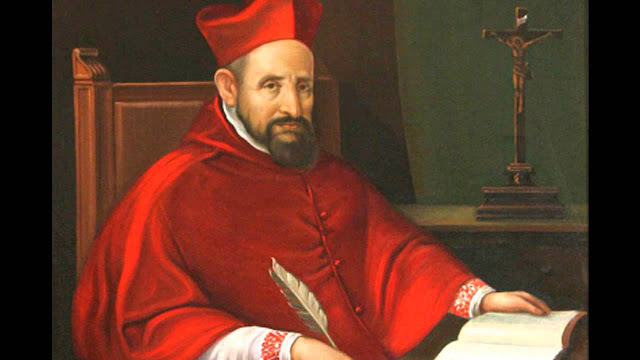 In 1588 Bellarmine was made Spiritual Father to the Roman College, but in 1590 he went with Cardinal Gaetano as theologian to the embassy Sixtus V was then sending into France to protect the interests of the Church amidst the troubles of the civil wars. Whilst he was there news reached him that Sixtus, who had warmly accepted the dedication of his "De Controversiis", was now proposing to put its first volume on the Index. This was because he had discovered that it assigned to the Holy See not a direct but only an indirect power over temporals. Bellarmine, whose loyalty to the Holy See was intense, took this greatly to heart; it was, however, averted by the death of Sixtus, and the new pope, Gregory XIV, even granted to Bellarmine's work the distinction of a special approbation. Gaetano's mission now terminating, Bellarmine resumed his work as Spiritual Father, and had the consolation of guiding the last years of St. Aloysius Gonzaga, who died in the Roman College in 1591. Many years later he had the further consolation of successfully promoting the beatification of the saintly youth. Likewise at this time he sat on the final commission for the revision of the Vulgate text. This revision had been desired by the Council of Trent, and subsequent popes had laboured over the task and had almost brought it to completion. But Sixtus V, though unskilled in this branch of criticism, had introduced alterations of his own, all for the worse. He had even gone so far as to have an impression of this vitiated edition printed and partially distributed, together with the proposed Bull enforcing its use. He died, however, before the actual promulgation, and his immediate successors at once proceeded to remove the blunders and call in the defective impression. The difficulty was how to substitute a more correct edition without affixing a stigma to the name of Sixtus, and Bellarmine proposed that the new edition should continue in the name of Sixtus, with a prefatory explanation that, on account of aliqua vitia vel typographorum vel aliorum which had crept in, Sixtus had himself resolved that a new impression should be undertaken. The suggestion was accepted, and Bellarmine himself wrote the preface, still prefixed to the Clementine edition ever since in use. On the other hand, he has been accused of untruthfulness in stating that Sixtus had resolved on a new impression. But his testimony, as there is no evidence to the contrary, should be accepted as decisive, seeing how conscientious a man he was in the estimation of his contemporaries; and the more so since it cannot be impugned without casting a slur on the character of his fellow-commissioners who accepted his suggestion, and of Clement VIII who with full knowledge of the facts gave his sanction to Bellarmine's preface being prefixed to the new edition. Besides, Angelo Rocca, the Secretary of the revisory commissions of Sixtus V and the succeeding pontiffs, himself wrote a draft preface for the new edition in which he makes the same statement: (Sixtus) "dum errores ex typographiâ ortos, et mutationes omnes, atque varias hominum opiniones recognoscere cœpit, ut postea de toto negotio deliberare atque Vulgatam editionem, prout debebat, publicare posset, morte præventus quod cœperat perficere non potuit". This draft preface, to which Bellarmine's was preferred, is still extant, attached to the copy of the Sixtine edition in which the Clementine corrections are marked, and may be seen in the Biblioteca Angelica at Rome. In 1592 Bellarmine was made Rector of the Roman College, and in 1595 Provincial of Naples. In 1597 Clement VIII recalled him to Rome and made him his own theologian and likewise Examiner of Bishops and Consultor of the Holy Office. Further, in 1599 he made him Cardinal-Priest of the title of Santa Maria in viâ, alleging as his reason for this promotion that "the Church of God had not his equal in learning". He was now appointed, along with the Dominican Cardinal d'Ascoli, an assessor to Cardinal Madruzzi, the President of the Congregation de Auxiliis, which had been instituted shortly before to settle the controversy which had recently arisen between the Thomists and the Molinists concerning the nature of the concord between efficacious grace and human liberty. Bellarmine's advice was from the first that the doctrinal question should not be decided authoritatively, but left over for further discussion in the schools, the disputants on either side being strictly forbidden to indulge in censures or condemnations of their adversaries. Clement VIII at first inclined to this view, but afterwards changed completely and determined on a doctrinal definition. Bellarmine's presence then became embarrassing, and he appointed him to the Archbishopric of Capua just then vacant. This is sometimes spoken of as the cardinal's disgrace, but Clement consecrated him with his own hands--an honour which the popes usually accord as a mark of special regard. The new archbishop departed at once for his see, and during the next three years set a bright example of pastoral zeal in its administration.